Supplies for a Pacific row…Sarah-style! Well, sort of. It is almost time to go but not quite. The weather isn’t quite ready for Gulliver and I yet, so we are staying onshore a bit longer and hoping to leave next week. As I push out from shore I will have two goals – one is to get away from Japan as quickly and safely as possible and the other is to avoid squashing by container ships and fishing boats which run up and down this coast and in and out of various ports in Choshi. 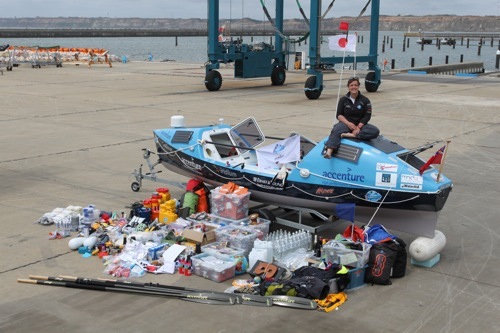 Meanwhile we have been trucking on with final preparations… checking kit and systems, sorting and waterproofing the food and medical kits and packing it all into the boat. As I type this, Gulliver is almost finished and ready to go. Exciting, eh?! The plan is to finish the packing tomorrow, wrap up the To Do List on Saturday and then rest and sleep some more. I have also been doing interviews with press around the world, so do keep an eye out for those and let us know what you see and where! The BBC’s Sarah Teale has so far posted two of three video reports that she filmed out here in Japan last month. All best and thanks for the great messages of support and wonderfully generous donations to my charities. 26 Responses to Standing by…. You Go Gurl!!! I’ll be following the entire trip and I know with Ricardo assisting you in your preps you will be set and ready!!!! Fair winds and a following sea love!!!! What a brave girl you are! The very thought of the “row” that you are about to embark on, frightens me to death!!!! We will be thinking of you next week when you leave. Where are you heading to? Have a save and healthy trip! Enjoy your adventure! Please rest your spirit until next week and get ready to fully enjoy your adventure! I look forward to seeing your videos and blogs from the big ocean. You are always in the heart of many people in the land of Japan. How will you find what you want, when you need it? I guess there is a checklist posted in the cabin…I think I heard you say 217 days of rowing to cross the Pacific! Surely you have a non stop beacon signal and your daily one ounce of dark chocolate! Love you! Godspeed Sarah! Best wishes from Rutland my whole family will be willing you on and keeping track of you via your emails and posts – you are soooo brave, I will tell everyone I know to follow your progress and sponsor you. It amazes me how much stuff girls always take with them…. Just kidding of course. A friend of mine in the merchant marines thought you were crazy for rowing the Pacific… until I told him you rowed the Indian… now he’s absolutely certain. I’m certain too. Certain you are amazing. Hope the last bits of preparation go as well as all the other. We shall be following you all the way with the ups and downs. Just take great care and all good wishes. Just do not forget where the chocolate bars are stashed…! Looking great…! Sayonara….come back to Japan soon…! I learned about you on a Japanese news website. How brave you are!! Gambare! I look forward to seeing you in your blog. Kata says that she hopes this will be a wonderful life experience for you! Hello Mrs Mitchell’s SJS group! Ryan, Kata and William – thanks for your lovely message. 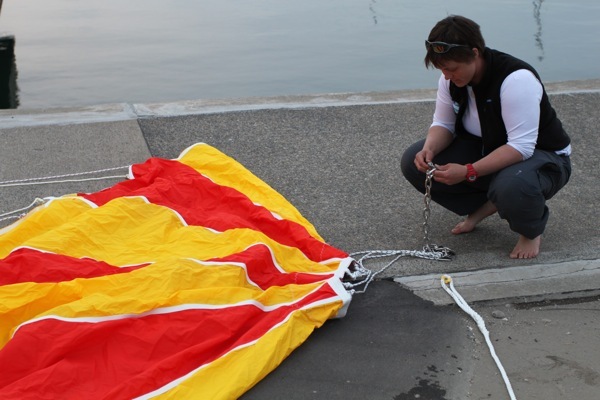 Do give a shout to Sara Davies Project Manager on hello@sarahouten.com to organise a little phone in to the lesson. We could surprise them?! How strange that you should write. I had a dream last night that we were all back at school for some big gig. 10 years…. wow. Hoping that you and K are all super well. Can’t wait for a paddle when I get back. Сара ради бога поосторожней пожалуста, береги себя! Brouught by bbc feature on you. Congrats and gods speed. I would like to join the supporters of Sarah’s big adventure. I send you cheers from New Haven, CT., the other side of your destination, Vancouver on the North American Continent. Great pic of all the gear that you need to fit in Gulliver, really puts it in perspective. Good luck for tghe departure. Looking forward to following your blog across the Pacific. Following you all the way Sarah, great effort so far. Good luck with the start, you’ll be fine. No need for any more warm up laps now! Hope you are well and looking forward to the next leg of your journey. Wishing you and that boat a safe trip!